In Sheets, double-click an RxMulti sheet. See Rx Manage. By default, the internal RxMulti sheet is used but it can be customized. Copy a RxMulti sheet or create a new one. Highlight the internal RxMulti sheet and click Copy. Then double click the custom sheet. Click New and create a new custom sheet with an RxMulti type. Double click an existing custom sheet of RxMulti type to edit. Highlight an existing custom sheet of RxMulti type, then click Duplicate to copy it. Edit the sheet as needed. For all options, see Sheet Field Types. You should be able to handle any regulations imposed by your state. If for some reason you cannot, please contact us and we will add any additional options that might be needed. Remove various lines, boxes, and wording so you can print to a preprinted Rx form. Add a dentist license number (OutputText: prov.dEANum, prov.StateLicense, prov.NationalProvID). Change the orientation or size (Edit Properties). Change the wording for generic substitution (Static Text). Add a second signature line for generic substitution. Add an RxStateID field (OutputText: prov.stateRxID). Remove or move the X that is marked by default for Generic Substitution Permitted. The X is two diagonal lines (Line:50,368,W:12,H12 and Line:62,368,W:-12,H:12). To remove the lines, delete them. To move the lines, select them, then press the up arrow on your keyboard (e.g. move to the Dispense as Written checkbox instead). Each Rx template requires a corresponding Prov.NameFL, PatNameFL, PatBirthdate, and Drug output text field. Each Output Text field has a number to indicate its order on the page. For example, prov.nameFL is for prescription 1, prov.nameFL2, is for prescription 2, etc. Simply make sure the output text fields for each prescription match the order on the page. Prescription 4 should have output text fields that end in 4, prescription 5 should have output text fields that end in 5, etc. 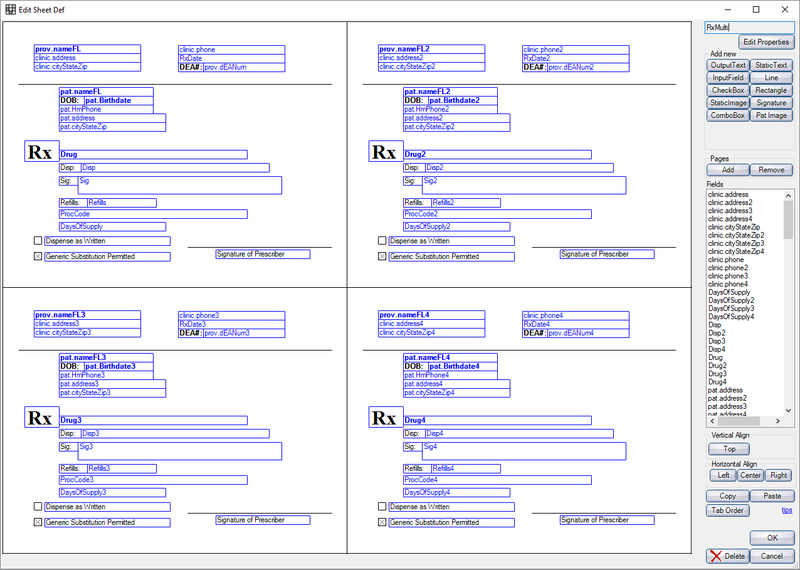 The internal RxMulti sheet prints up to 4 prescriptions per page, but it can be customized to print up to 6. When printing multiple prescriptions, any unused Rx sheets will have VOID printed across them.